Ref Tec International is the only company in our industry that is making a real effort to service the industrial side of refrigerant recovery. Their products are solid and built with long life and durability as the design focus. Rick Roland, Engineer Certified Refrigerant Services Inc.
Reftec has recently been certified by the American Bureau of Shipping (ABS). Our products are being utilized in the cruise industry, naval applications as well as onboard tankers and freight liners. Please contact us for your ocean going vessel HVAC needs. Ideal for large tonnage centrifugal or screw chillers. Recovers a BLAZING 325-lb/min liquid & 6-lb/min vapor! 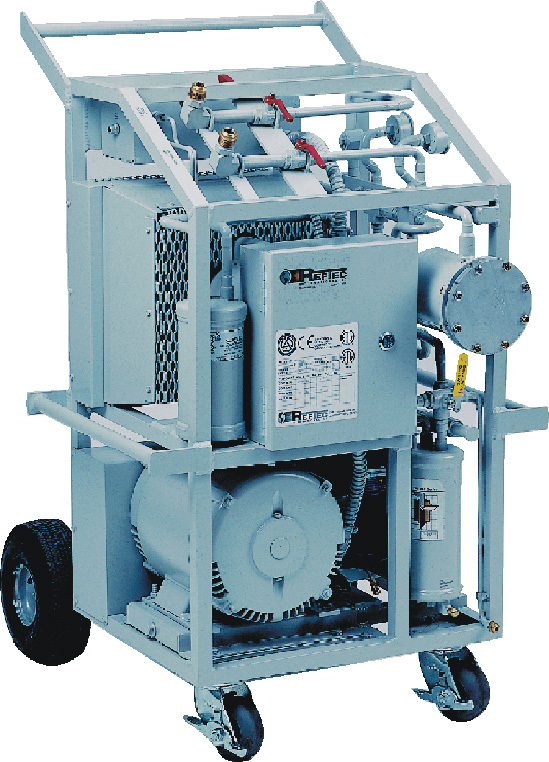 Rugged open drive compressor provides years of reliable service, even on refrigerants heavily contaminated with oil, air, moisture, & acids. Equipped with in-line oil separator. Services R12, R22, R134a, R502 & other high pressure refrigerants. lxwxh 32" x 29" x 45"
© 2009 RefTec International Systems, LLC. All rights reserved.